Status asthmaticus is considered a medical emergency. It is the extreme form of an asthma exacerbation that can result in hypoxemia, hypercarbia, and secondary respiratory failure. In practice, the role of the physician is to prevent this from happening through patient compliance with controller medications (eg, steroid inhalers) in an outpatient setting. Patient education plays a very major role in preventing recurrent attacks of status asthmaticus. In a study by Rice et al,  inpatient asthma education was studied in children and adolescents following status asthmaticus. Subjects were enrolled in two groups. One group received the usual posthospitalization instructions and the other group received additional education by lay asthma education volunteers. The group that received the additional education had better compliance in the outpatient setting. See Pediatric Status Asthmaticus for information about status asthmaticus in children. Management goals for status asthmaticus are (1) to reverse airway obstruction rapidly through the aggressive use of beta2-agonist agents and early use of corticosteroids, (2) to correct hypoxemia by monitoring and administering supplemental oxygen, and (3) to prevent or treat complications such as pneumothorax and respiratory arrest. (See Treatment and Medication. Figure depicting antigen presentation by the dendritic cell, with the lymphocyte and cytokine response leading to airway inflammation and asthma symptoms. Physiologically, acute asthma has two components: an early, acute bronchospastic aspect marked by smooth muscle bronchoconstriction and a later inflammatory component resulting in airway swelling and edema. Within minutes of exposure to an allergen, mast cell degranulation is observed along with the release of inflammatory mediators, including histamine, prostaglandin D2, and leukotriene C4. These substances cause airway smooth muscle contraction, increased capillary permeability, mucus secretion, and activation of neuronal reflexes. The early asthmatic response is characterized by bronchoconstriction that is generally responsive to bronchodilators, such as beta2-agonist agents. The release of inflammatory mediators primes adhesion molecules in the airway epithelium and capillary endothelium, which then allows inflammatory cells, such as eosinophils, neutrophils, and basophils, to attach to the epithelium and endothelium and subsequently migrate into the tissues of the airway. Eosinophils release eosinophilic cationic protein (ECP) and major basic protein (MBP). Both ECP and MBP induce desquamation of the airway epithelium and expose nerve endings. This interaction promotes further airway hyperresponsiveness in asthma. This inflammatory component may even occur in individuals with mild asthma exacerbation. Bronchospasm, mucus plugging, and edema in the peripheral airways result in increased airway resistance and obstruction. Air trapping results in lung hyperinflation, ventilation/perfusion (V/Q) mismatch, and increased dead space ventilation. The lung becomes inflated near the end-inspiratory end of the pulmonary compliance curve, with decreased compliance and increased work of breathing. The increased pleural and intra-alveolar pressures that result from obstruction and hyperinflation, together with the mechanical forces of the distended alveoli, eventually lead to a decrease in alveolar perfusion. The combination of atelectasis and decreased perfusion leads to V/Q mismatch within lung units. The V/Q mismatch and resultant hypoxemia trigger an increase in minute ventilation. In the early stages of acute asthma, hyperventilation may result in respiratory alkalosis. This is because obstructed lung units (slow compartment) are relatively less numerous than unobstructed lung units (fast compartment). Hyperventilation allows carbon dioxide removal via the fast compartment. However, as the disease progresses and more lung units become obstructed, an increase in the slow compartments occurs, resulting in decreased ability for carbon dioxide removal and eventually causing hypercarbia. Asthma results from a number of factors, including genetic predisposition and environmental factors. Patients often have a history of atopy. The severity of asthma has been correlated with the number of positive skin test results. Gastroesophageal reflux disease is another risk factor for asthma, with studies indicating that the reflux of gastric contents with or without aspiration can trigger asthma in susceptible children and adults. Animal studies have shown that the instillation of even minute amounts of acid into the distal esophagus can result in marked increases in intrathoracic pressure and airway resistance. This response is thought to be due to vagal and sympathetic neural responses. Asthma affects up to 10% of the US population. Prevalence has increased by 60% in all ages in the past two decades. A significant rise in hospitalization and asthma mortality rates has accompanied the increased incidence. Status asthmaticus is usually more common among persons in low socioeconomic groups, regardless of race, as they have less access to regular specialist medical care. People who live alone are particularly affected. The worldwide incidence of asthma is unclear but is estimated to be about 20 million cases. The dramatic rise in incidence has been attributed, in part, to pollution and industrialization. In general, unless a complicating illness such as congestive heart failure or chronic obstructive pulmonary disease is present, status asthmaticus has a good prognosis if appropriate therapy is administered. A delay in initiating treatment is probably the worst prognostic factor. Delays can result from poor access to health care on the part of the patient or even delays in using corticosteroids. Patients with acute asthma should use corticosteroids early and aggressively. Pneumothorax may complicate acute asthma because of increased airway pressure or as a result of mechanical ventilation. Superimposed infection can also occur in intubated patients. Patients may require a chest tube for pneumothorax or aggressive antibiotic therapy for a superimposed infection. Asthma is a chronic illness. Patients and their families must be provided with a team that can offer education and follow-up care. Prior to discharge, the team that provides asthma education should meet with the family and the patient to impart information regarding maintenance, monitoring, and measures for environmental control. Early identification of exacerbations and the importance of adherence with therapy are paramount. Patients require instruction in the appropriate use of inhalers, to be compliant with therapy, and to practice stress-avoidance measures. Stress factors (ie, triggers of asthma attacks) include pet dander, house dust, and mold. Strongly discourage patients from smoking, this habit should be avoided at all costs. For patient education information, see the Asthma Center, as well as Asthma, Asthma FAQ, and Understanding Asthma Medications. Rice JL, Matlack KM, Simmons MD, Steinfeld J, Laws MA, Dovey ME, et al. LEAP: A randomized-controlled trial of a lay-educator inpatient asthma education program. Patient Educ Couns. 2015 Jun 29. [Medline]. Han P, Cole RP. Evolving differences in the presentation of severe asthma requiring intensive care unit admission. Respiration. 2004 Sep-Oct. 71(5):458-62. [Medline]. Vaschetto R, Bellotti E, Turucz E, Gregoretti C, Corte FD, Navalesi P. Inhalational anesthetics in acute severe asthma. Curr Drug Targets. 2009 Sep. 10(9):826-32. [Medline]. Hanania NA, David-Wang A, Kesten S, Chapman KR. Factors associated with emergency department dependence of patients with asthma. Chest. 1997 Feb. 111(2):290-5. [Medline]. Vital Signs: Asthma Prevalence, Disease Characteristics, and Self-Management Education --- United States, 2001—2009. CDC MMWR. Available at http://www.cdc.gov/mmwr/preview/mmwrhtml/mm6017a4.htm?s_cid=mm6017a4_w. Accessed: August 20, 2014. Graudenz GS, Carneiro DP, Vieira RP. Trends in asthma mortality in the 0- to 4-year and 5- to 34-year age groups in Brazil. J Bras Pneumol. 2017 Jan-Feb. 43 (1):24-31. [Medline]. O'Hollaren MT, Yunginger JW, Offord KP, Somers MJ, O'Connell EJ, Ballard DJ, et al. Exposure to an aeroallergen as a possible precipitating factor in respiratory arrest in young patients with asthma. N Engl J Med. 1991 Feb 7. 324 (6):359-63. [Medline]. [Guideline] Dinakar C, Oppenheimer J, Portnoy J, et al. Management of acute loss of asthma control in the yellow zone: a practice parameter. 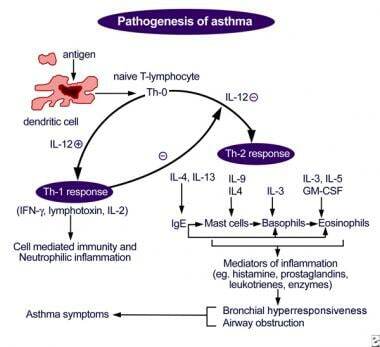 Ann Allergy Asthma Immunol. 2014 Aug. 113 (2):143-59. [Medline]. Magadle R, Berar-Yanay N, Weiner P. The risk of hospitalization and near-fatal and fatal asthma in relation to the perception of dyspnea. Chest. 2002 Feb. 121 (2):329-33. [Medline]. Summers RL, Rodriguez M, Woodward LA, Galli RL, Causey AL. Effect of nebulized albuterol on circulating leukocyte counts in normal subjects. Respir Med. 1999 Mar. 93 (3):180-2. [Medline]. Hunt SN, Jusko WJ, Yurchak AM. Effect of smoking on theophylline disposition. Clin Pharmacol Ther. 1976 May. 19 (5 Pt 1):546-51. [Medline]. [Guideline] National Heart, Lung, and Blood Institute. Managing exacerbations of asthma. National Asthma Education and Prevention Program (NAEPP). Expert panel report 3: guidelines for the diagnosis and management of asthma. National Guideline Clearinghouse; [Full Text]. Saadeh CK, Goldman MD, Gaylor PB. Forced oscillation using impulse oscillometry (IOS) detects false negative spirometry in symptomatic patients with reactive airways. J Allergy Clin Immunol. 2003. 111:S136. Schultz TE. Sevoflurane administration in status asthmaticus: a case report. AANA J. 2005 Feb. 73(1):35-6. [Medline]. Fuller CG, Schoettler JJ, Gilsanz V, Nelson MD Jr, Church JA, Richards W. Sinusitis in status asthmaticus. Clin Pediatr (Phila). 1994 Dec. 33(12):712-9. [Medline]. Sacha RF, Tremblay NF, Jacobs RL. Chronic cough, sinusitis, and hyperreactive airways in children: an often overlooked association. Ann Allergy. 1985 Mar. 54(3):195-8. [Medline]. Schwartz HJ, Thompson JS, Sher TH, Ross RJ. Occult sinus abnormalities in the asthmatic patient. Arch Intern Med. 1987 Dec. 147(12):2194-6. [Medline]. Dockhorn RJ, Baumgartner RA, Leff JA, Noonan M, Vandormael K, Stricker W, et al. Comparison of the effects of intravenous and oral montelukast on airway function: a double blind, placebo controlled, three period, crossover study in asthmatic patients. Thorax. 2000 Apr. 55 (4):260-5. [Medline]. Camargo CA Jr, Smithline HA, Malice MP, Green SA, Reiss TF. A randomized controlled trial of intravenous montelukast in acute asthma. Am J Respir Crit Care Med. 2003 Feb 15. 167 (4):528-33. [Medline]. Ferreira MB, Santos AS, Pregal AL, Michelena T, Alonso E, de Sousa AV, et al. Leukotriene receptor antagonists (Montelukast) in the treatment of asthma crisis: preliminary results of a double-blind placebo controlled randomized study. Allerg Immunol (Paris). 2001 Oct. 33 (8):315-8. [Medline]. Andrews T, McGintee E, Mittal MK, et al. High-dose continuous nebulized levalbuterol for pediatric status asthmaticus: a randomized trial. J Pediatr. 2009 Aug. 155(2):205-10.e1. [Medline]. Best evidence topic reports. Bet 3. Endotracheal adrenaline in intubated patients with asthma. Emerg Med J. 2009 May. 26(5):359. [Medline]. Beach C, Marcuccio E, Beerman L, Arora G. Accelerated Idioventricular Rhythm in a Child With Status Asthmaticus. Pediatrics. 2015 Aug. 136 (2):e527-9. [Medline]. Stephanopoulos DE, Monge R, Schell KH, Wyckoff P, Peterson BM. Continuous intravenous terbutaline for pediatric status asthmaticus. Crit Care Med. 1998 Oct. 26(10):1744-8. [Medline]. Newman LJ, Richards W, Church JA. Isoetharine-isoproterenol: a comparison of effects in childhood status asthmaticus. Ann Allergy. 1982 Apr. 48(4):230-2. [Medline]. Chiang VW, Burns JP, Rifai N, Lipshultz SE, Adams MJ, Weiner DL. Cardiac toxicity of intravenous terbutaline for the treatment of severe asthma in children: a prospective assessment. J Pediatr. 2000 Jul. 137(1):73-7. [Medline]. Kalyanaraman M, Bhalala U, Leoncio M. Serial cardiac troponin concentrations as marker of cardiac toxicity in children with status asthmaticus treated with intravenous terbutaline. Pediatr Emerg Care. 2011 Oct. 27(10):933-6. [Medline]. Castro-Rodriguez JA, Rodrigo GJ. Efficacy of inhaled corticosteroids in infants and preschoolers with recurrent wheezing and asthma: a systematic review with meta-analysis. Pediatrics. 2009 Mar. 123(3):e519-25. [Medline]. Haskell RJ, Wong BM, Hansen JE. A double-blind, randomized clinical trial of methylprednisolone in status asthmaticus. Arch Intern Med. 1983 Jul. 143(7):1324-7. [Medline]. Ream RS, Loftis LL, Albers GM, Becker BA, Lynch RE, Mink RB. Efficacy of IV theophylline in children with severe status asthmaticus. Chest. 2001 May. 119(5):1480-8. [Medline]. [Full Text]. Wheeler DS, Jacobs BR, Kenreigh CA, Bean JA, Hutson TK, Brilli RJ. Theophylline versus terbutaline in treating critically ill children with status asthmaticus: a prospective, randomized, controlled trial. Pediatr Crit Care Med. 2005 Mar. 6(2):142-7. [Medline]. Press S, Lipkind RS. A treatment protocol of the acute asthma patient in a pediatric emergency department. Clin Pediatr (Phila). 1991 Oct. 30(10):573-7. [Medline]. Ciarallo L, Brousseau D, Reinert S. Higher-dose intravenous magnesium therapy for children with moderate to severe acute asthma. Arch Pediatr Adolesc Med. 2000 Oct. 154(10):979-83. [Medline]. Glover ML, Machado C, Totapally BR. Magnesium sulfate administered via continuous intravenous infusion in pediatric patients with refractory wheezing. J Crit Care. 2002 Dec. 17(4):255-8. [Medline]. Scarfone RJ, Loiselle JM, Joffe MD, Mull CC, Stiller S, Thompson K, et al. A randomized trial of magnesium in the emergency department treatment of children with asthma. Ann Emerg Med. 2000 Dec. 36(6):572-8. [Medline]. Bessmertny O, DiGregorio RV, Cohen H, et al. A randomized clinical trial of nebulized magnesium sulfate in addition to albuterol in the treatment of acute mild-to-moderate asthma exacerbations in adults. Ann Emerg Med. 2002 Jun. 39(6):585-91. [Medline]. Vaiyani D, Irazuzta JE. Comparison of Two High-Dose Magnesium Infusion Regimens in the Treatment of Status Asthmaticus. J Pediatr Pharmacol Ther. 2016 May-Jun. 21 (3):233-8. [Medline]. Heshmati F, Zeinali MB, Noroozinia H, Abbacivash R, Mahoori A. Use of ketamine in severe status asthmaticus in intensive care unit. Iran J Allergy Asthma Immunol. 2003 Dec. 2(4):175-80. [Medline]. Golding CL, Miller JL, Gessouroun MR, Johnson PN. Ketamine Continuous Infusions in Critically Ill Infants and Children. Ann Pharmacother. 2016 Mar. 50 (3):234-41. [Medline]. Elliot S, Berridge JC, Mallick A. Use of the AnaConDa anaesthetic delivery system in ICU. Anaesthesia. 2007 Jul. 62(7):752-3. [Medline]. Burburan SM, Xisto DG, Rocco PR. Anaesthetic management in asthma. Minerva Anestesiol. 2007 Jun. 73(6):357-65. [Medline]. Tobias JD. Inhalational anesthesia: basic pharmacology, end organ effects, and applications in the treatment of status asthmaticus. J Intensive Care Med. 2009 Nov-Dec. 24(6):361-71. [Medline]. Rishani R, El-Khatib M, Mroueh S. Treatment of severe status asthmaticus with nitric oxide. Pediatr Pulmonol. 1999 Dec. 28(6):451-3. [Medline]. Mroueh S. Inhaled nitric oxide for acute asthma. J Pediatr. 2006 Jul. 149(1):145; author reply 145. [Medline]. Hunt LW, Frigas E, Butterfield JH, Kita H, Blomgren J, Dunnette SL, et al. Treatment of asthma with nebulized lidocaine: a randomized, placebo-controlled study. J Allergy Clin Immunol. 2004 May. 113 (5):853-9. [Medline]. Mikkelsen ME, Pugh ME, Hansen-Flaschen JH, Woo YJ, Sager JS. Emergency extracorporeal life support for asphyxic status asthmaticus. Respir Care. 2007 Nov. 52(11):1525-9. [Medline]. Coleman NE, Dalton HJ. Extracorporeal life support for status asthmaticus: the breath of life that's often forgotten. Crit Care. 2009. 13(2):136. [Medline]. [Full Text]. Hebbar KB, Petrillo-Albarano T, Coto-Puckett W, Heard M, Rycus PT, Fortenberry JD. Experience with use of extracorporeal life support for severe refractory status asthmaticus in children. Crit Care. 2009. 13(2):R29. [Medline]. [Full Text]. Noizet-Yverneau O, Leclerc F, Bednarek N, et al. [Noninvasive mechanical ventilation in paediatric intensive care units: which indications in 2010?]. Ann Fr Anesth Reanim. 2010 Mar. 29(3):227-32. [Medline]. Ram FS, Wellington S, Rowe BH, Wedzicha JA. Non-invasive positive pressure ventilation for treatment of respiratory failure due to severe acute exacerbations of asthma. Cochrane Database Syst Rev. 2005 Jan 25. CD004360. [Medline]. Ueda T, Tabuena R, Matsumoto H, Takemura M, Niimi A, Chin K, et al. Successful weaning using noninvasive positive pressure ventilation in a patient with status asthmaticus. Intern Med. 2004 Nov. 43(11):1060-2. [Medline]. Steinack C, Lenherr R, Hendra H, Franzen D. The use of life-saving extracorporeal membrane oxygenation (ECMO) for pregnant woman with status asthmaticus. J Asthma. 2016 Jun 24. 1-5. [Medline]. Niimi KS, Lewis LS, Fanning JJ. Impairment of Venous Drainage on Extracorporeal Membrane Oxygenation Secondary to Air Trapping in Acute Asphyxial Asthma. J Extra Corpor Technol. 2015 Jun. 47 (2):109-12. [Medline]. Leatherman JW, McArthur C, Shapiro RS. Effect of prolongation of expiratory time on dynamic hyperinflation in mechanically ventilated patients with severe asthma. Crit Care Med. 2004 Jul. 32(7):1542-5. [Medline]. Silva Pde S, Barreto SS. Noninvasive ventilation in status asthmaticus in children: levels of evidence. Rev Bras Ter Intensiva. 2015 Oct-Dec. 27 (4):390-6. [Medline]. Rampa S, Allareddy V, Asad R, Nalliah RP, Allareddy V, Rotta AT. outcome of invasive mechanical ventilation in children and adolescents hospitalized due to status asthmaticus in the United States: A population based study. J Emerg Med. vovember 2014. 47:571-2. González García L, Rey C, Medina A, Mayordomo-Colunga J. Severe subcutaneous emphysema and pneumomediastinum secondary to noninvasive ventilation support in status asthmaticus. Indian J Crit Care Med. 2016 Apr. 20 (4):242-4. [Medline]. Ricketti PA, Unkle DW, Lockey R, Cleri DJ, Ricketti AJ. Case study: Idiopathic hemothorax in a patient with status asthmaticus. J Asthma. 2016 Sep. 53 (7):770-3. [Medline]. Shiue ST, Gluck EH. The use of helium-oxygen mixtures in the support of patients with status asthmaticus and respiratory acidosis. J Asthma. 1989. 26(3):177-80. [Medline]. Kim IK, Phrampus E, Venkataraman S, Pitetti R, et al. Helium/oxygen-driven albuterol nebulization in the treatment of children with moderate to severe asthma exacerbations: a randomized, controlled trial. Pediatrics. 2005 Nov. 116(5):1127-33. [Medline]. Kudukis TM, Manthous CA, Schmidt GA, Hall JB, Wylam ME. Inhaled helium-oxygen revisited: effect of inhaled helium-oxygen during the treatment of status asthmaticus in children. J Pediatr. 1997 Feb. 130(2):217-24. [Medline]. Anderson M, Svartengren M, Bylin G, Philipson K, Camner P. Deposition in asthmatics of particles inhaled in air or in helium-oxygen. Am Rev Respir Dis. 1993 Mar. 147(3):524-8. [Medline]. Carvalho I, Querido S, Silvestre J, Póvoa P. Heliox in the treatment of status asthmaticus: case reports. Rev Bras Ter Intensiva. 2016 Jan-Mar. 28 (1):87-91. [Medline]. Oguzulgen IK, Turktas H, Mullaoglu S, Ozkan S. What can predict the exacerbation severity in asthma?. Allergy Asthma Proc. 2007 May-Jun. 28(3):344-7. [Medline]. Miller AG, Breslin ME, Pineda LC, Fox JW. An Asthma Protocol Improved Adherence to Evidence-Based Guidelines for Pediatric Subjects With Status Asthmaticus in the Emergency Department. Respir Care. 2015 Dec. 60 (12):1759-64. [Medline]. Khawaja A, Shahzad H, Kazmi M, Zubairi AB. Clinical course and outcome of acute severe asthma (status asthmaticus) in adults. J Pak Med Assoc. 2014 Nov. 64 (11):1292-6. [Medline]. Phumeetham S, Bahk TJ, Abd-Allah S, Mathur M. Effect of high-dose continuous albuterol nebulization on clinical variables in children with status asthmaticus. Pediatr Crit Care Med. 2015 Feb. 16 (2):e41-6. [Medline]. Beute J. Emergency treatment of status asthmaticus with enoximone. Br J Anaesth. 2014 Jun. 112 (6):1105-8. [Medline]. Fast Five Quiz: Are You Familiar With Key Components of Status Asthmaticus?